Jakarta Players' FIRST SHOW of the 2012-2013 Season is ON! 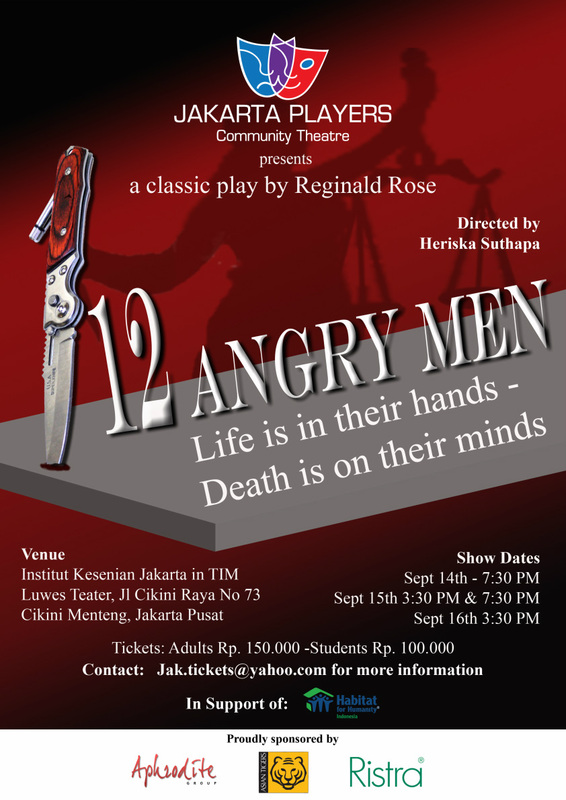 In 12 Angry Men, Reginald Rose explores the social and moral complexities of the American system of trial by a jury of ones peers. Twelve jurors are charged with deciding whether or not a young man has murdered his father, a crime that carries the mandatory sentence of death.Forced to produce a unanimous verdict of guilty or not guilty, jurors confront the evidence, each other, and their own deeply held prejudices. One compassionate juror questions whether the state has proved the young man guilty "beyond a reasonable doubt." The debate and ensuing re-examination of evidence pushes each juror to consider his or her own definition of innocence and guilt in modern society. * Suitable for ages 13+. Limited Seating. Advanced Bookings Only.